Since then there have been qualifications, post facto interpretations, charges and countercharges, but the gentlemen’s agreement has not been rescinded. Mr. Stevens may not realize it — his political perceptions are not quick — but he has already walked too far with the devil to turn back now. The walk began when the Secretary of the Army elected to make the issue Senator McCarthy’s rude handling of a distinguished officer. To be sure, an issue involving officer morale was at stake, not to mention the question of how Senators should behave toward witnesses whether they are brigadier generals or cafeteria workers. But General Zwicker was simply given the routine treatment prescribed for all but so-called “friendly” witnesses. No, the real issue was simply whether McCarthy should be permitted to continue his march to power unopposed or, stated another way, whether the principle of the separation of powers still prevails. By contrast, the issue on which Mr. Stevens elected to stand was not only trivial; it was misleading. 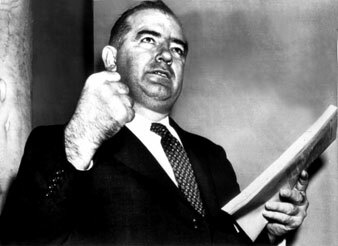 For it gave McCarthy precisely what he wanted, namely, a chance to have his phony demagoguery taken seriously. McCarthy had no case against the army. On the face of it, there was nothing wrong or improper in the discharge granted Major Peress, and once granted it could not be revoked. And the gossip about “the communications relay-machine operator” — a clerk twice cleared by army loyalty investigators, who denied under oath that she was a Communist, who could not be positively identified by the informer who had named her as a Communist, and whose duties consisted of feeding “unintelligible” tape into a telegraph machine — was so preposterous that even McCarthy was somewhat embarrassed. If anything could be sillier than Mr. Stevens’s pathetic assertion that he had not surrendered — “he merely thought they [Dirksen, McCarthy, Potter, and Mundt] wanted to look at his sword,” one observer commented — it is the contention that he was wise to act as he did because “the army had a weak case.” McCarthy doesn’t care whether a case is strong or weak. He is always in complete control of the hearings and he knows that his bluffs will not be called. He does not need to prove a charge; all he needs to do is to whisper “communism” and even men sworn to uphold and protect the Constitution will act like so many sheep. But there is another reason why in each of the numerous crises that have arisen in the course of the witch hunt the guardians of constitutional power have finally elected to surrender. What they want is a “nice” witch hunt, directed by men of decorum, subject to “proper rules” which make it possible to lynch a witness politely. On this score McCathy is right — it is impossible to conduct a successful heresy hunt without using his methods. Thus when faced with a clear-cut choice between rejecting the witch hunt, which they regard as an essential defense against communism, or capitulating to him, they have taken the second course in every case but one when Allen Dulles refused to permit McCarthy to muscle in on the operations of the Central Intelligence Agency. Unfortunately Mr. Stevens is not the only one who has surrendered to McCarthy; it is just that his surrender was conspicuous. For example, after publishing fine editorials on the Zwicker incident on successive days, the New York Times proceeded to give away about as much ground in a third editorial as it had undertaken to defend in the first two. For on the day of Mr. Stevens’s humiliating surrender the Times devoted an editorial to the Subversives Activities Control Board in which the hearings of the board were favorably compared with “the irresponsible sideshows staged so frequently in Washington.” Devoted solely to the pursuit of heresy, the Subversive Activities Control Board has been as destructive of due process and intellectual freedom as any of the inquisitorial committees. What the Times was saying is simply that the hearings of the board have been “quiet,” that is, they have not been conducted by high-powered medicine men like McCarthy. In this year’s campaign McCarthy has hand-picked Robert L. Jones, a former researcher for Senator Potter, to oppose Senator Margaret Chase Smith in Maine. Senator Smith will discover that sponsorship of President Eisenhower’s proposal to strip citizenship from any American convicted of conspiring to overthrow the government will not save her from McCarthy’s attacks, her sponsorship of this dangerous measure has made her McCarthy’s hostage. He can never be effectively opposed by those who have granted his major premise. The ineffectiveness of the opposition to McCarthy is further illustrated by Senator Morse’s current protests against “one-man” Congressional inquiries. But McCarthy’s hateful methods are simply a function of the task he has undertaken. He would no more respect any rules the Senate might adopt than he would abide by a gentlemen’s agreement. Besides, for him the hour is late. No matter how reckless or desperate the particular gamble may be, he has no choice now but to take it, for he has reached the point of no return in his bid for total power. Nor will his opponents recognize that McCarthy operates on two levels. On one he is the good showman and astute politician. McCarthy shrewdly recognized the value of a brawl with the army. It was “big news” by any definition, and it cast him in the role of the tough guy who does not hesitate to push the to brass around. It even gave him a chance to pose as the defender of the Constitution. But while he plays by ear he also follows the score. He has an excellent understanding, as he has demonstrated many times, of the blueprint by which European fascists undertook the conquest of power. He knows that he must “coordinate” the army if he is to win total power; an army maimed by professional officers, with a high sense of responsibility, cannot be as easily induced to engage in dangerous gambles with a nation’s safety as one run by opportunists. In every major sortie he has undertaken to date McCarthy has operated with the assistance of a “fifth column” within the particular agency under attack. He was coached by inside opportunists in the Voice of America investigation; he has informers in the State Department; and his access to F.B.I. reports has raised comment on more than one occasion. Can it be, then, that he is without allies in the Defense Department? Does anyone believe that the Pentagon is united in its opposition to him because of his “rudeness” to General Zwicker? It is not necessary to underscore the implications of columnist George Sokolsky’s comment in the New York Journal-American (February 26): “Many army officers are prepared to talk and do talk privately when assured that they will not be exposed. Without the assistance of what has come to be known as ‘the Pro-American Underground,’ little data could be made available.” Once the opportunists in the Pentagon become convinced that their superiors will buckle under political attacks, the current secret shift to McCarthy might become a landslide. That an effective liaison already exists is shown by many circumstances. For one thing, the similarity of Senator McCarthy’s views on several issues — China is one — with some of the President’s old antagonists in the armed services is hardly coincidental. When Mr. Stevens learns a little more about McCarthy and how he operates — when he begins, that is, to start looking over his shoulder in the Pentagon — he will be even less likely to force a showdown than he was ill this instance. Nor is it reasonable to assume that the Commander in Chief will at last decide to act. Ironically, the President and his advisers seem to believe that they cannot repudiate McCarthy without destroying his “usefulness” in this year’s Congressional campaign, whereas almost everyone else now knows that McCarthy intends to use the campaign, if he can, to capture outright control of the Republican Party. President Eisenhower should not be trying to defeat Senators Douglas, Humphrey, Anderson, Murray, and Gillette; they are more likely to support him on crucial foreign-policy issues than any Republicans McCarthy might campaign for. Indeed, the Eisenhower wing of the Republican Party is now nearly encircled, and every day it continues the collaboration with McCarthy the right wing of the party is strengthened. Today the President’s advisers tell him that it is inexpedient to oppose McCarthy; tomorrow they may tell him that it is too late. On his recent cross-country junket McCarthy made it quite clear that he intends to raise a great hue and cry about “betrayal in the Far East.” In Los Angeles he outlined a policy which if adopted would make it impossible for the Administration to reduce tensions in Asia. His easy victory in the Zwicker incident should be sufficient warning of his power to upset any minor accords that may emerge from the conference which convenes in Geneva on April 26 or to use these accords to undermine the President’s leadership of the Republican Party. The Zwicker incident will have served a purpose, however, if it shocks national opinion into a realization of the gravity of “the present danger.” The awakening process is long overdue. For if an effective political opposition to McCarthy exists anywhere in the country today it has yet to make its appearance. By a vote of 362 to 1 — only Congressman Roy W. Wier voting against it — the House has just given Mr. Velde’s Committee on Un-American Activities a new appropriation of $275,000. This is a measure of the effective opposition to McCarthy in Congress. Nevertheless, as The Nation has steadily insisted, McCarthy is vulnerable. Emperor Joe is an artful bluffer but he has no clothes. His social program is “anti-communism,” nothing more; his foreign policy is aimed at isolating America and then provoking a war with China. McCarthy has a guerrilla following that extends from coast to coast and that cuts across party lines, but as yet he has no genuine organizational or bureaucratic support. While he is a stooge for important economic interests — the recent hearings in Albany and Boston might have been ordered by General Electric — he does not have the united support of big business by any means. At the moment he is engaged in a desperate race to capture power before the tensions of the cold war relax and the “rolling adjustment” rolls over him. Now, therefore, is the time to break the hypnotic spell of his “anti-Communist” necromancy. This is not so difficult a task as it appears to be. But the neo-fascist movement of which McCarthy is now the recognized national leader — every village and town and every organization has its “bite-size” would-be leader — cannot be countered by smart tactics or clever manipulation; it must be opposed politically. The forces exist to oppose it, but they need to be organized around a program that will raise the real issues of the time by a leadership that has rejected the notion that communism can be fought as a heresy. What must be recognized is that the texture as well as the structure of American society is being warped by anti-democratic pressures, so that the longer a showdown is delayed, the harder it becomes to stage one. The extent of this damage is not known, but in some fields — education is a case in point — it will not be easily repaired. Despite his latest and dizziest triumph McCarthy lives on borrowed time. But so did Hitler — for years — until his backstage sponsors finally overcame their distaste for his methods and placed him in power. And this too could happen here, with or without gentlemen’s agreements.